Well, you have the controllable and the uncontrollable. I’m a pre-production stickler, so I had detailed shot lists and schedules pretty well ironed out. Those things you can control. But other things, you have to just roll with: we had to replace an actress, deal with unforeseen construction noises and even had a cast member’s mother go into the hospital, likely to die. So we had our fair share of obstacles to deal with. But despite everything, the script and shot list changed very little: I got 95% of what I wanted. I’m a big fan of the original Halloween, Psycho, and Hatchet for the Honeymoon. But, otherwise, except for the few slashers that offer really original concepts or surprises, I find them a little tiresome. I prefer supernatural or psychological scares to slasher scares. Give me Carrie, The Sixth Sense, or The Exorcist any day. The goal should always be to serve the story. My psychological thriller Deadly Revisions is very moody with dark colors, shadowy lighting and creeping camera work. 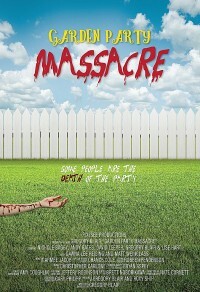 But Garden Party Massacre is more of a spoof, with the comedy element above the horror element, so I wanted a light, bright atmosphere throughout. I also wanted to use tripods and fluid camera shots at first and then, when things get crazy, story wise, I wanted the camerawork to get crazy, too--so it’s all hand-held and whip pans and whatnot after that. I’m a big believer in form and content reflecting each other and, in this case, I think it adds to the fun. I didn’t know who I was going to play at first. I liked all the characters. But as I began thinking of actors and who fit what roles, things moved around a bit. I ended up picking guys who might not normally be cast in the roles I cast them in, but who I knew would make them hilariously their own. I love that Andy Gates is our would-be-hero, but he’s the shortest one of all; I love that David Leeper isn’t the least bit the stereotypical wispy, lispy gay guy; and so it fit that I could play dumb blond Link instead of the obvious choice of a giant, lumbering hunk. I think creative casting is in short supply, nowadays, and it’s so refreshing when it happens. I knew from day one that I wanted Nichole Bagby to play Addison. I had worked with her on On the Rocks and knew she was hilarious and would make feisty Addison a treat. I also knew I wanted to have Dawna Lee Heising [Dawna Lee Heising interview - click here] play Melanie. Dawna is extremely dedicated and has such a unique quality I knew would make Melanie pop on screen. When my original actress for Reena had to bow out, I immediately thought of Lise Hart. She played Bill Oberst jr’s [Bill Oberst jr interview - click here] embittered wife in Deadly Revisions, but I had seen her do comedy and knew she’d be a hoot in the role. I guess the lesson is: Be excellent, professional and kind and people will think of you again when they need to cast or get asked for a recommendation. I recommend actors to other directors all the time. But only those with all three attributes. Every shoot is a roller-coaster ride of gleeful joy, frustrating obstacles and racing against the clock. Because of the work I did in pre-production, there was far more joy than anything else. Also because of the cast and crew. My co-producer Roxy Shih [Roxy Shih interview - click here] helped me get a crew that was efficient, professional, calm and focused. We got through the day’s shot list early several times; when we didn’t, everyone kept plowing ahead till we finished. The more organized you are, the smoother the shoot goes and the more relaxed the set is. And when people are relaxed, it allows for creativity, clarity and attention, confidence in the production, and a better general mood all around. And we are here to have fun. Yeah, we hope to make a buck, but really, we do this for love and joy. We’ve already started submitting it to festivals, so it will begin having some public screening as a result later this year. Distribution will come after the bulk of the festival circuit. Festivals want to sell tickets and they can’t do that as effectively if people can stream your movie at home for less. But rest assured: If you miss it in theatres, Garden Party Massacre will be out on DVD, Blu-ray, VOD and all that jazz as soon as the time is right. I’m acting all over the place! Alex Kavutskiy and Ariel Gardner’s On the Rocks is out on VOD now. Films coming out later this year include Aaron Mento’s Ugly Sweater Party and Hunter Johnson’s Serena Waits. I’ll also be on episode 5 of season 2 of Escape the Night. Filming this year are Blake Fitzpatrick’s Abaddon, Michael Rodriguez’s The Deadly Kind [Michael S. Rodriguez interview - click here], Adam Steigert’s Fang [Adam R. Steigert interview - click here] and Kim Queen’s Look Back. I play everything from a womanizing dance teacher to a hilariously disturbed religious nutbag. I’m also excited about Heretiks, starring Michael Ironside (Scanners) and Claire Higgins (Hellraiser). It’s based on my original screenplay, adapted and directed by Paul Hyett. It’s a really creepy film that takes place in the 17th century about a young woman who is saved from execution and led to a priory to repent her sins but discovers a greater evil lies within. That should be coming out later this year. 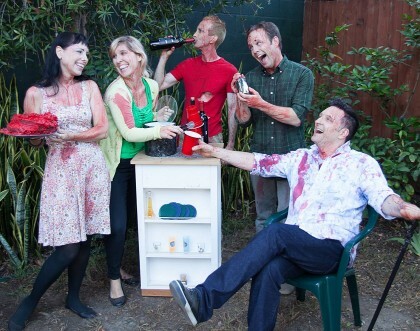 We’ve opened up an opportunity on our website www.GardenPartyMassacreFilm.com for people to tell us what festivals in what cities they’d like to see the film screen. On the site is a place to make a donation and tell us which festival you want the funds to go to. We’ll use your donation directly for the submission fee. We can’t promise we’ll get accepted, but we’ll give you a shout out, regardless.